Darkness is defined as the absence of LIGHT. Conflict comes when you bump into all the unknown in the dark and you fight for your space and your security. 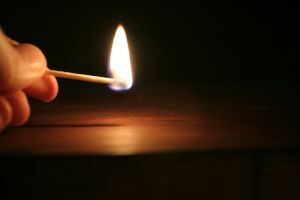 When a match is struck even in the darkest corner it can give us the ability to see what lies around us. We find out that what we bumped into was a chair, a door or even another person just like ourselves lost in the dark. Darkness exists no longer when the smallest candle is lit. Be a light where ever you go today. It’s not just for you but for the people around you who need help seeing things just a bit clearer. The more I can see, the more people can see me and the more they can see themselves in me! So goes the life of the messenger. I’m headed once more to the hospital with my father. Light a candle for us all.